’Adam’ - Figurative sculpture that evolved through workshops at a pupil referral unit. A residency working with children excluded from mainstream education at a small specialist school in Hackney. The visionary head teacher specified a figurative sculpture that the kids could learn from and allowed the project develop. 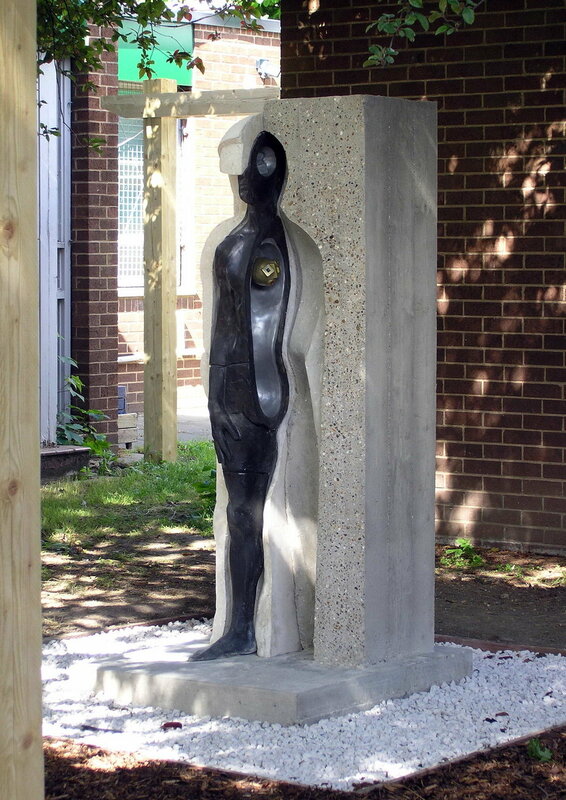 The sculpture became a focus for a previously unused area of the school which became ‘The peace garden’. The idea for the sculpture developed through workshops with the students. 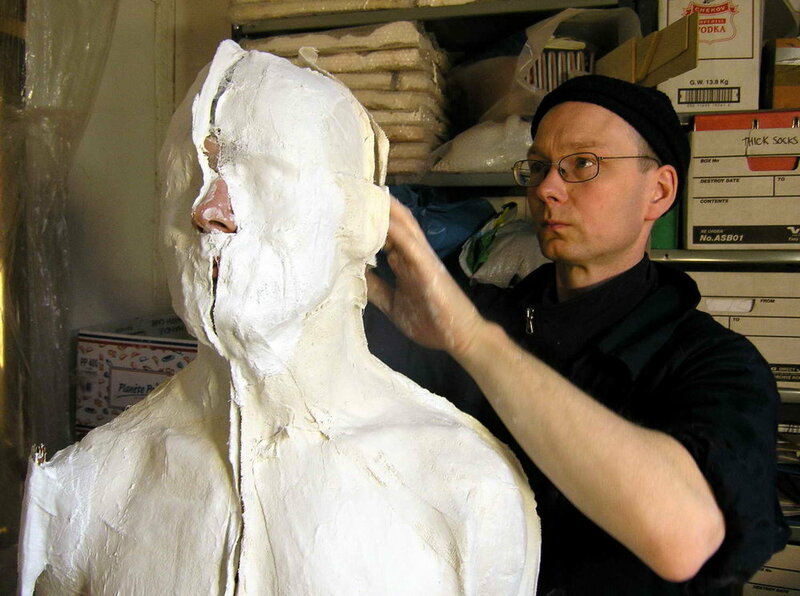 Focused workshops: face casting and working with plaster. In order to take the body casting further I volunteered. The pupils then took part in face casting but only half a face at a time. This split sculpture inspired the final piece. The staff at Daniel House were fantastic. Pupils developed their own sculptures. Face casting requires trust. To which the pupils responded. Armature for a plaster head. Modelled and carved plaster head. The graphite finish informed the finish for the final sculpture. Fabrication Process: none of the pupils were prepared to have a full body cast so my assistant Renato stepped up. Stephen in my studio in Brentford. Pouring concrete into the shuttering on site. The shapes of the different sections took some time to work out. Plaster jackets into which hot rubber (gelflex) would be poured. Shuttering for the sculpture with steel reinforcement. The former for the curved shell made from white concrete. Pouring the rubber for the footprint. A figure stripped back through defensive layers. Initial 'rangefinding' workshops: looking at figurative sculptures and exploring processes. First session: making collages from different figurative sculptures. Attempts at carving soft blocks weren’t popular. Students visited my studio in North Kensington. Making hand casts proved popular with the pupils. Working in a PRU can be quite challenging. After the sculpture was completed the school commissioned me to build this pergola with seating for use as an outdoor teaching space. Commissioned by Freeform Arts Trust Hackney. 2005. Daniel House School (Pupil Referral Unit), Clissold Road, Stoke Newington, London. Closed 2010 - (fate of the sculpture unknown). Reinforced concrete, glass fibre resin, slate, aluminium, brass fillers and coloured pigments.